History speaks. Names are part of history. Names can tell a story. What names best represent your people, country, or history? And have you adapted an alphabet letter? And at the height of my felicity of becoming an uncle for the first time, I felt a tad sad. I felt old. And it inspired me to share my family’s creative story. Once upon a time, in 1976 to be precise, I was born and given a name – Ninos. Then after a few years, 1982, my sister was born and she was given a name – Nahrain. A few years later, in 1987, my other sister was born and she was given a name – Neeneev. It took a few years for my family to complete the trilogy. All names start with the letter “N”. My mom and dad created a representation an ancient Assyria – our history. 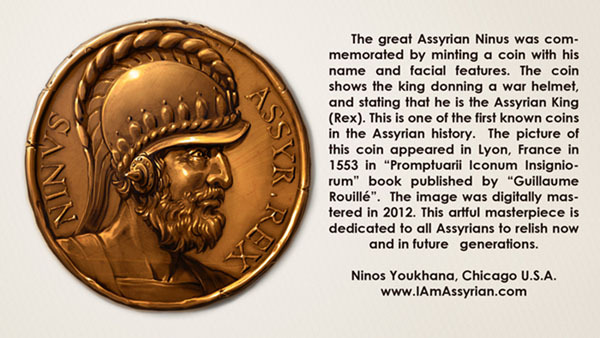 Ninos (or Ninvs) represents an ancient Assyrian king. Nahrian represents the ancient Mesopotamia (Tigris and Euphrates), water is a source of life. Neeneev represents the ancient land of Assyria – a 4000 years old civilization. My family added a meaning for the letter “N” of nationalism and native. Assyrians are the native people of Iraq. It was a necessity to preserve our Assyrian national heritage. The purpose in naming us thus was to tell a story from our shared past. They did this to preserve our identity, the Assyrian identity in a modern time Arab land Iraq. As a contrast and why it matters, Assyrians are not Arabs. In Iraq Assyrian Christian names are dominated by Arab names. Millions of Iraqi male citizens are named with Mohammed, Hussein, Ali, or Abass. In the midst of that are just a few Assyrian names are laden with Assyrian symbolism. Our names became our identity. Assyrians are leaving Iraq to America, but Assyrian names are disappearing in America. Assyrians are naming their kids with western names, or names with an Italian or French accent, or just from a soap opera in the West. It is the first sign of assimilation. I dislike it. Sargon, Adad, Ashor, and Ninos are Assyrian male names. Nahrain, Neeneev, and Shamiran are Assyrian female names. They reflect historical figures. They connote Assyrian nationalism and a larger narrative. By calling our names, people are remembering Assyrian cultural history. A name is a cultural property that collectively tells a cultural story. As for my nephew, Eli is a Biblical name. I will wait and see if my sister and her husband adapt the letter “E” and name their future kids with names that start with “E”. I like the alphabet letter “N”. It represents newness. I like the sound and the look of N on the page. A lot of beautiful words start with “N”: narrative, nascent, neologism, neophyte, noble, or reached nirvana when I became naturalized American citizen. There is a new notion of novelty in that. And then, there is numinous – a feeling every time her name is called, it echoes centuries of history and culture. Our Assyrian names help the next generation learn about us, names that make us nostalgic for our past and stand noticed between American or western style names. Thank you so much Ninos for sharing your family’s nice story, I agree with your opinion. I like the letter “N” too. its one of my name and my son’s name letters. I’m sure that you are very proud for having such very nice name”Ninos”. Good luck.